Pauly is a discretionary trader targeting price levels and zones with the inclusion of Fibonacci lines to enhance probabilities. He trades forex, crude oil, gold and S&P on a short-term basis. Pauly opts not to publish his last name. But he isn’t private about his trading activity. 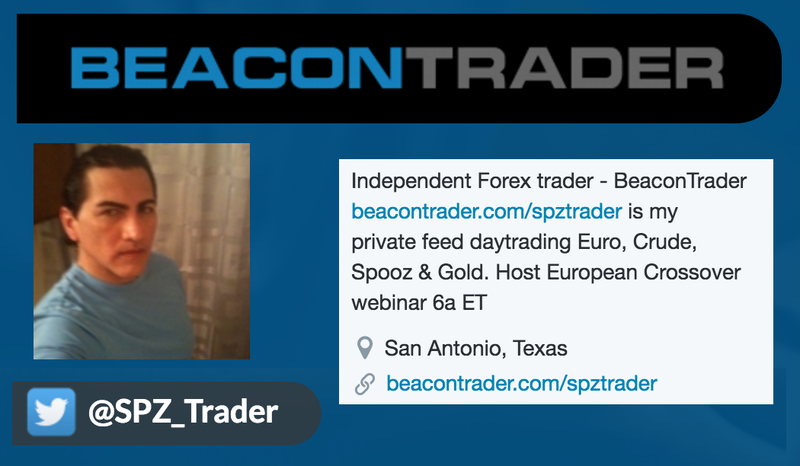 He shares his trades on Beacon Trader, and he is very active on Twitter as @spz_trader. And of course he is open to sharing his insights with us here on Trade Talk. I hope you enjoy hearing from Pauly. Pauly: I always had an interest in the markets and a certain curiosity of how things worked. I wondered how premises were put together. When I first started trading, I would watch interviews of traders and analysts giving their reasoning of a trade or position. I enjoyed how they framed their take the same way an attorney presents a case. As I learned more about the markets, I was able to distinguish whether the position made sense to me. I suppose it’s like putting a puzzle together. You see the individual pieces, and as you begin to link them together, you begin to visualize a probable outcome. In the beginning, most of us have been at a point where the trading seems as though it should be simple; you have an idea, it’s logical and off you go. You eventually find that a lot of variables play into the equation—time frames, length of a correction, markets that get over-extended. Markets are always changing. For example, quantitative easing in 2008 changed a lot of things. Trading is a journey. What are the challenges you face daily in your trading? Pauly: One challenge in daily trading is trying to stay a few steps ahead of the crowd. Markets and trends change quickly. You only have to look at crude oil as an example. My trading outlook is very short term, so I look for themes that are driving the market over the next few days. Whether it’s FX, gold or crude, more often than not, there is an underlying theme playing towards or against, i.e., crude cutbacks from OPEC, Euro can’t sell off, gold demand. Pauly: Platforms are about execution and functionality for the individual trader. A swing trader does not require fast execution like a day trader or a scalper. A trader needs to try out several platforms before they can determine what works for them. It’s not “one size fits all.” A backup platform and backup data provider are musts. No matter how prepared one is, something will always happen in due time. Pauly: Technology has made it easier for people to communicate via Twitter/fintwit, chat rooms and webinars or share ideas through blog posts. There are apps that allow one to trade remotely from a desk via a phone or tablet. Technology has driven costs lower for trade execution, allowing the ability for many to day trade. But one thing technology will not provide is the Holy Grail. It’s still about hard work, a game plan and risk management. Can you define a key to your trading success? Pauly: Risk management is the key! No matter your edge, we all encounter losses. Regardless of how good or how much sense a trade makes, it can be a loser. We can’t let one bad trade undo a lot of hard work. It’s poor use of our mental and time resources managing a losing trade. Dump the loser and move on to the next opportunity.